A long-delayed bike path in Boston with roots in the era of Mayor Thomas Menino has been revamped, with construction expected to commence next year on the first stretch of the 3.5-mile run between Roxbury and the Seaport District. City officials have finalized new designs for the South Bay Harbor Trail, a project that got underway in 2008 and was expected to be completed in 2010, but has since languished. They intend to build the trail in phases, with the first section expected to get underway next spring. 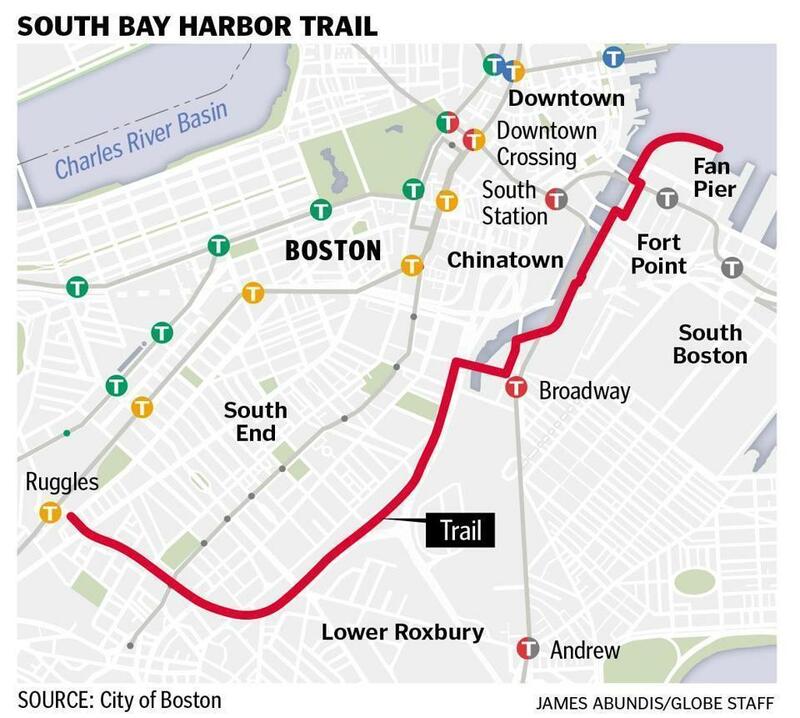 The full path will run between the Fort Point Harborwalk, near the Gillette headquarters, and the Ruggles MBTA station, where cyclists can further connect onto the path along the Southwest Corridor. The Harbor Trail’s origins date to 2001, when the nonprofit Save the Harbor/Save the Bay began advocating for it as a way to connect more landlocked neighborhoods with the waterfront. The group raised about $1 million worth of funding and pro-bono engineering work for early design and planning work. Patricia Foley, the group’s president, said the reemergence of the path is better late than never. The first phase, a three-quarter-mile stretch, is one of the more complicated sections, near Albany Street and along and under the Southeast Expressway to its connection with the Harborwalk. The path will be separated from the street as it crosses under the highway and initially moves through South Boston. When it rejoins city streets over the Broadway bridge and along Dorchester Avenue, the path will become a protected bike track, with curbing and pylons separating cyclists from vehicle traffic. James Gillooly, deputy director of the city’s transportation department, said roadway limitations, including crossing water and railroad tracks, forced planners to put the path on city streets. “We had to do the best we could with the bridges,” he said. The rest of the trail will cut through properties between Albany Street and the Mass. Ave. Connector before joining Melnea Cass Boulevard on the final run to Ruggles. Most of this work will be incorporated into a broader $25 million redesign of Melnea Cass, scheduled to be put to bid in 2019. Along Melnea Cass, landscaping will separate the cycle tracks from the road, replacing an old bike trail that Gillooly said has become “functionally obsolete” because of poor maintenance. One of the reasons the project languished is that the city could not secure access to private property at the Boston Flower Exchange in the South End, at a key juncture for the path. But the Flower Exchange has since been sold to a developer that plans to build office and lab space. Gillooly said the new property owner is more willing to allow for access, bridging the gap between Melnea Cass and Albany Street.